my first grow. need some help on lighting questions. Discussion in 'Marijuana Grow Journals' started by scumby, Jun 4, 2006.
hey, i just set up a grow room in my closet i have a 20 wat flour hanging with a fixture 2 15 wat cfl soon ill have more compact flours. and im using aluminum foil in the mean time until i get some myler from potato chip bags.i'm using 2 one gallon things with holes in the bottom for drainage.i'm using mircle gro extended release soil with fert in it.it feeds my plants up to 3 months. any suggestions?i'm very low budget and working with hardly any money.i'm using bag seeds from good bud i got that ive saved over a few months.thanks in advance for ur replies! you're going to need a lot more light, you should focus on getting more light before bothering finding things to use for reflecting light. also, you should've checked around here before getting that soil. the ferts already in it are bad for starting seedlings in... you can't control how much ferts they are getting and they get over-fertilized and burnt up. so, if you can get a different soil that'd help.... if you live in US go to walmart and get their generic potting soil. you can get 40 pound bags of it for $1.66.. then try to get more light..
should i get more cfl ? i want to but its going to take a little for money i have another 20 wat flour that im going to set up with the ones i already have. i am germinating the seeds in the soil. after i had checked which ones were alive and which were dead by putting it over night in a thing of water that has no chlorine in it. the ones that sunk i planted.i dont really like the paper towel method. 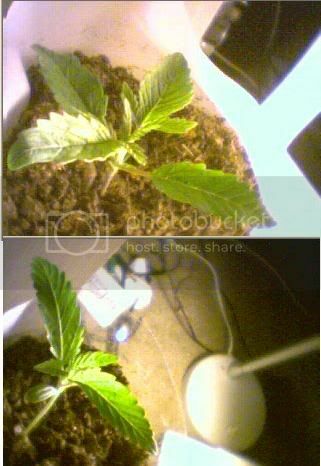 maybe its stupid of me but i was hoping that they would g row stronger in the soil.maybe slow growth down i dont know?i did read afterwards that mircle gro was a bad idea but i say why notgive it a shot if they die i have more seeds and ill buy conventional soil by scotts from walgreens down the street.once they sprout i'll post pictures up along with my grow room for better feedback.keep checking in a few days ill have it up. THIS IS 2 WEEKS AFTER GERMINATION!any ideas?